purchase of a California Fuel Trip Permit, which costs $30. the proper credentials for your vehicles. 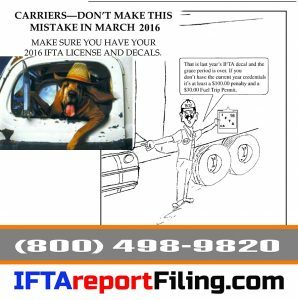 Do I have to register my truck for IFTA in California? California does not include recreational vehicles in the IFTA tax unless they are used in conjunction with any business endeavor. Recreational vehicles include motor homes, pickup trucks with attached campers and buses when used exclusively for personal pleasure by an individual. How do I apply for an IFTA license in California? You can request Form 400-IF, Application for an IFTA License and Decals by contacting the Motor Carrier Section of California. They will send you an application which must be completed and returned with the required California fees. Upon acceptance California will issue you proper credentials that will allow you to operate in all member jurisdictions. What fees are associated with IFTA in California? California charges a $10 annual fee and a $2.00 fee for each set of decals. California requires one set of decals per qualified commercial motor vehicle. What IFTA credentials will I receive from Sky Transport Solutions and the state California? You will receive one California IFTA license for your business and a set of 2 decals. One decal must be placed on the exterior portion of the cab’s passenger side. The second decal must be placed in the same position on the driver’s side. Your credentials are all valid for the calendar year. You must renew your license and order new decals each year. Are there penalties for traveling without valid IFTA credentials or a fuel trip permits in California? If you enter California without a valid California Fuel Trip Permit or IFTA credentials you are subject to a penalty. The penalty amount ranges from $100 to $500 or more (if you owe fuel tax, the penalty may be higher than $500). California also requires you to purchase a fuel trip permit when traveling into the state. Without that permit, you are subject to a possible seizure of your vehicle. If that occurs, your vehicle will not be released until you pay all money due to the State pf California, including any costs associated with the seizure of the vehicle. Do I file a quarterly fuel tax report if I didn’t run during the quarter? Yes, California still requires you to submit a “zero” report even if no fuel or IFTA mileage was traveled in that quarter. What is the penalty and interest rate for filing a late quarterly fuel tax report In California? There is a late penalty of $50 or 10% of the net tax liability, whichever is greater. Interest is computed on all delinquent taxes dues each jurisdiction at a rate of .4167% per month. Even if you have a net refund due to you from the state of California, interest will still be applied to each jurisdiction for any underpayment of fuels use tax to that jurisdiction and is calculated beginning the day after the due date of the return for each month, or fraction of a month, until paid. How do I obtain a IFTA return for the state of California? IFTA quarterly use tax returns can be filed online at http://www.boe.ca.gov/elecsrv/efiling/efileifta.htm. All required payments must be made electronically. You will no longer receive paper returns from the state of California. Is there an alternative to IFTA registration in California? If you qualify for IFTA but do not choose to register for IFTA with the state of California, you may instead obtain fuel trip permits to travel into or through each member jurisdiction as needed. However, you will be required to purchase a California Fuel Trip Permit every time you reenter California after traveling outside the state. Carriers traveling in non-IFTA jurisdictions must still comply with the fuel tax reporting requirements of those jurisdictions. Where can I get more information on California IFTA regulations and conditions?